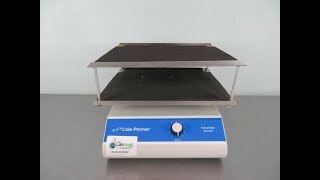 The Cole-Parmer Adjustable Rocker Shaker provides a flexible double rocking platform that can be used in multiple places. This lab shaker mixer tilts back and forth up to 20° and is adjustable, with adjustable speeds between 4-160 tilts per minute, letting you accomplish a wide variety of mixing actions. This lab rocker is an ideal choice for blotting techniques, staining and destaining gels, and thanks to the temperature tolerance range, can be used in a cold room or heated area for hybridization applications. The double platforms give you a generous amount of room for staining trays, bod bottles, culture flasks, petri dishes and more, up to 10 lbs. held in place with a nonskid, removable, black rubber mat. Spill-resistant design channels fluids away from Cole-Parmer Adjustable Rocker Shaker internal components. The base of this rocking shaker is constructed of durable cast aluminum for extra stability. This Cole-Parmer Adjustable Rocker Shaker has been fully inspected and is operating without issue. All of our lab equipment comes backed with our standard warranty. Should you have any questions, please don't hesitate to contact us.